Welcome to another BEST interview. 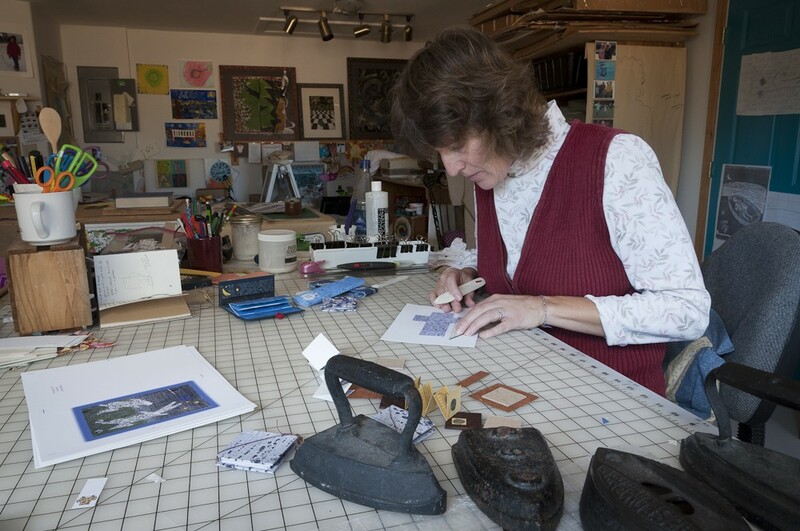 Today I have the pleasure to introduce you to Camille Riner of Prints and Paper. In her studio in the Black Hills of South Dakota she makes artist books, printed notecards, and prints to frame and hang. Hi Camille, thank you for taking your time to talk with me. Please tell us a little bit about your background. Have you always been a book artist? I studied graphics at the UW in Madison, Wisconsin, and after I finished my MFA, I taught graphics and foundations at a small college in southern Michigan. I have been a traditional printmaker and papermaker for many years and several years ago I decided to do a series of images that would be bound into a simple Coptic book. I made the paper for the relief print series with Beck Whitehead, a paper and book artist from the Southwest School of Art and Craft in Texas. I loved what she was doing so when I had an opportunity to learn more four years ago I took an introductory book arts class with Bonnie Stahlecker. - I was hooked. I loved working with my students but after seven years my husband, a photographer, and I decided to try starting our own business and moved back to South Dakota. Today we work together publishing photographic books. I do the design for our books so between publishing deadlines I am able to work on my own artist book projects. 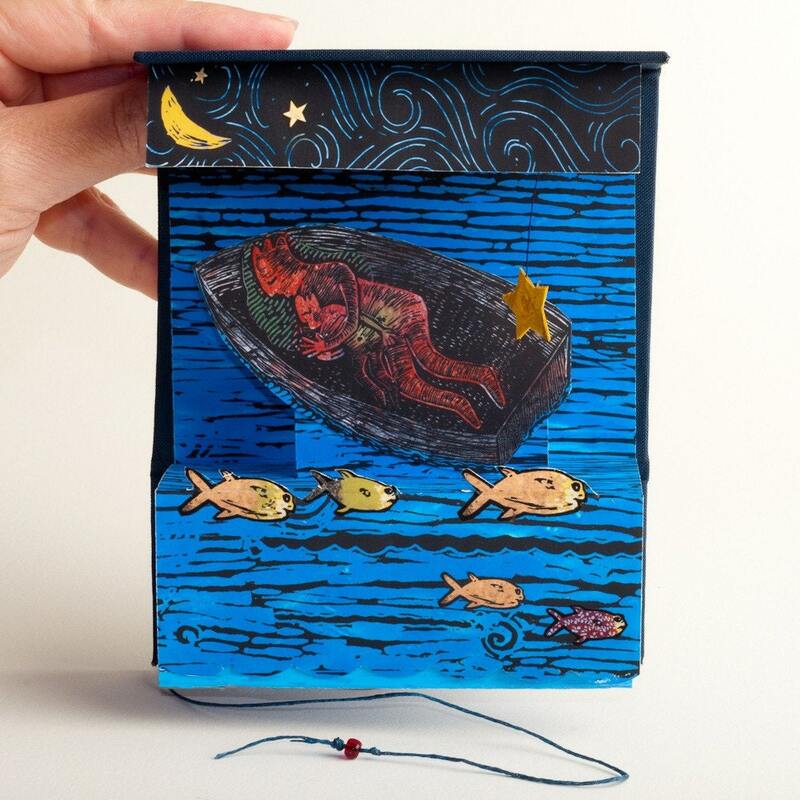 How is your experience with shifting your field of work to the book arts? Was it difficult to acquire the knowledge and confidence to do so? We as book artist are so lucky to have such a generous group of people in our field. I have been impressed with how willing people are to help one another and share ideas. ETSY is a wonderful place to find mentors. I have found it exciting to be a part of BEST as well as the BKARTS list and am grateful to all the folks who have been wiling to give advise or encourage me. Thank you fellow BEST artists! Tell us a little more about your books. Would you like to introduce us to one special piece? I did a portfolio this summer with a group of artists that was called "Tempus Fugit" (time flies, see picture above). I think that all my books are personal but "Tempus Fugit" seems to be close to my heart right now: I have an eight year old daughter who seems to be turning from a little girl into a big one very quickly and my feelings about all that seemed to come together in the relief print I did for this portfolio. I spent a large part of the summer turning this print into a book. It was a fun project, from the poem I wrote for the interior to deciding how I would make the figures pop out and enclose the whole thing. I especially liked the little red button I found for the clasp, it reminded me of how we want to preserve memories of our time with our children and the sweet clothing they have worn. How would you describe your books in general? I would describe my books as moving, folding prints. I am always on the lookout for a new book structure that I can use with one of my print ideas. This summer I enjoyed learning the tetra tetra flexagon structure. It was one of those folding books that you look at and say, "how does that work?" I couldn't resist learning how to make the structure and I happened to have a new relief print that I wanted to turn into a book. Many of my books start with either a structure I have discovered or a print I want to turn into a book. My images start out as hand pulled relief prints, some on handmade paper, that I scan in and use in my books. Some of my prints are as large as three feet across as originals that I photograph and reduce. I like the way this process concentrates the image and gives the viewer a more intimate way to look at it. To layout most of my books I use Photoshop to combine the printed image, additional textures and typography. How do you work between books? I mean, do you have a special way or place to get fresh ideas or old ones sorted out? I am a big believer in sketchbooks/journals. I find them valuable for rediscovering ideas, as references or for image development. I take a sketchbook with me when I have extra time to journal, go on trips or when I am hiking or visiting a museum. My sketchbooks include things people say, inspiring quotes, textures, graphics, poems, book titles or interesting images. When I go to look for something in an old sketchbook I am always surprised at how I find myself developing similar ideas just in different ways. It is amazing how much we forget; with a sketchbook you are reminded. For the months of November and December I have a holiday special in my shop. Anyone who purchases one of my books will get one of my note cards included in your order for free with each book ordered. Let me know which image(s) you would like when you make your order. 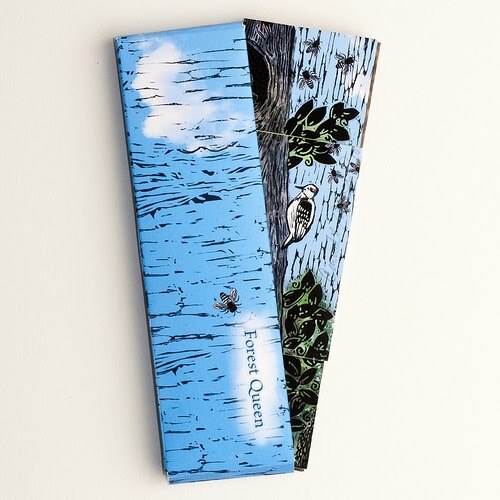 Card and book must ship to the same address. To see more of Camille's work, you can of course browse her shop on Etsy, and if you then still don't have seen enough, you can find even more images of her books at Flickr. Beautiful books and art prints - wow! Camille, your work is really stunning! I love love love the block prints. 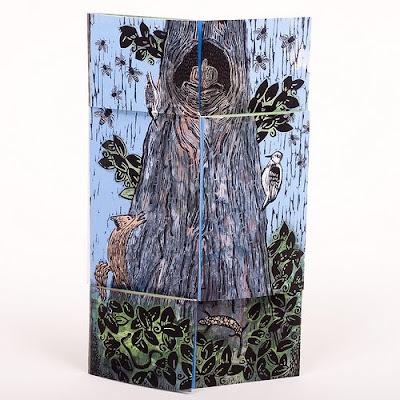 I love to see book art and printmaking combined. This is something I want to head towards in the next couple of years.